In medieval Europe the Lenten season was marked in churches by the hanging of a curtain between the nave and the choir. Because this was a period of penitential fasting meant to instill a deeper hunger for righteousness, the curtain was commonly referred to as a hunger veil. Shielding the high altar, it symbolized the separation between God and his people prior to Christ’s ultimate redemption act. On Good Friday the veil was removed, restoring to parishioners a view of the altar, now all the more precious for its having been hidden for forty days. The tradition of the hunger veil dates back to at least the 9th century but virtually disappeared in the 15th. Then in 1976 it was revived by Misereor, the relief and development arm of the Catholic Church in Germany. Every other year the organization commissions an artist—usually from Africa, Asia, or Latin America—to paint a veil for Lent, then it sells large-scale printed copies to churches to raise funds for poverty alleviation projects. In 2015 it released its twentieth. These veils give insight into the hopes and longings of people from different cultures. Such is the case with Haitian artist Jacques-Richard Chery’s 1982 contribution to the project. Titled The Tree of Life, Chery’s veil depicts a black Jesus who suffers with the Haitian people, confronts evil, and through his broken body provides redemption. His crucifixion on a tree forms the centerpiece of the composition, around which are arranged eight scenes of contemporary life and biblical revelation. All these are encompassed by a rainbow, a sign of promise. The lowest tier of the painting shows Christ present in situations of struggle. On the bottom left is a boatload of people being thrashed around on a turbulent sea, which can be interpreted metaphorically as navigation through the storms of life, or literally as a group of Haitian migrants in pursuit of a better life elsewhere. The image is also reminiscent of the Gospel accounts of Jesus calming a storm on the Sea of Galilee with the words “Peace! Be still”—though here he too is gripped by fear. In the next scene Jesus is being beaten to the ground with a military baton. He looks pleadingly out from under the boot of a soldier while a tank, a warplane, and submarines press in. The bottom right corner shows an uphill struggle to escape the forces of death: hunger, poverty, and disease. As the waters threaten to swallow the people, some step on others to get ahead, their pockets full of money, while others extend helping hands. The middle tier shows Christ speaking truth to power, exposing the sin of greed. On the left men with pickaxes exploit the land, sending animals running for protection under Jesus’s arms. Having given in to the temptation of wealth (signified by the house and car), these men ignore God’s mandate to care for the earth, seeking only their own advancement, regardless of the environmental cost. On the right Jesus drives out extortionists from his temple, those who seek to profit from poverty. The top tier shows Christ participating in the new heaven that has been won for us, banqueting in community with his people. On the left a man in a business suit points to the Ten Commandments (a tablet labeled “human rights”) and reacts with shock and conviction as he realizes he has been violating God’s law. Beside this is a scene of Paradise, where God’s design for the flourishing of creation is actualized. People harvest fruits from the Tree of Life, carrying them away in baskets to share with others. There is no competition here—everyone is fed. Everyone lives in harmony with one another and with the animals and the land. Linking the currently disparate realms of earth and heaven is Jesus himself, stretched out on the tree. Blood from his wounds waters the roots, causing new seeds to sprout. Chery’s painting offers a vision of what is and what could be. It invites us to make Christ the central reality of our lives and, like him, to give of ourselves and our resources and work toward putting things right in the world. 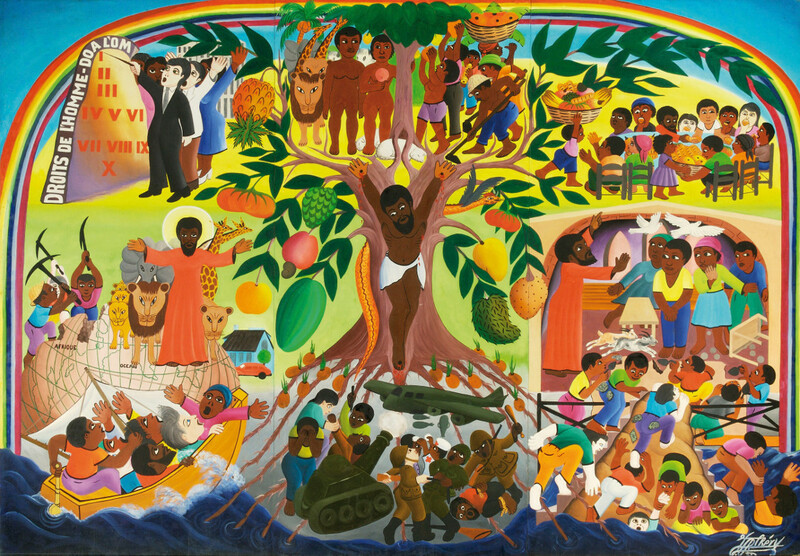 Jacques-Richard Chery: The Tree of Life, 1982. Acrylic on cloth. Misereor Lenten veil © MVG Medienproduktion. Jacques-Richard Chery was born in 1928 in Cap-Haitien on the northern coast of Haiti. In 1951 he became involved with Le Centre d’Art in Port-au-Prince, a government-funded art education center and gallery that was instrumental in the development and promotion of modern Haitian art. Internationally exhibited, Chery is known for his playful paintings of children, public transport vans (“tap-taps”), weddings and carnivals, and merchants carrying giant fruits on their heads—all executed in the colorful, “naive” style that characterizes the art of the country. Victoria Emily Jones lives in the Baltimore area of the United States, where she works as an editorial freelancer and blogs at https://artandtheology.org. Her educational background is in journalism, English literature, and music, but her current research focuses on ways in which the visual arts can stimulate renewed theological engagement with the Bible. She is in the process of developing an online biblical art gallery, a selective collection of artworks from all eras that engage with specific texts of scripture. Karl Adam Heinrich Kellner, Heortology: A History of the Christian Festivals from their Origin to the Present Day (London: Kegan Paul, Trench, Trübner & Co., 1908), p. 104. Gregor Kollmorgen, “Lenten Veils,” New Liturgical Movement, March 2, 2012. Klemens Richter, The Meaning of the Sacramental Symbols: Answers to Today’s Questions (Collegeville, MN: The Liturgical Press, 1990), pp. 175–76.